JPEG 2000 UHD/4K Media Function provides visually lossless compressed transport of UHD signals with ultra-low latency over 1G/10G IP Ethernet. NOTE: This product is a version, a variant or a module of the main Virtuoso product line. For further information about this product, visit the main listing product page. Nevion Virtuoso can run multiple instances of the JPEG 2000 UHD/4K Media Function on a single platform with built-in network aggregation to 10G Ethernet. 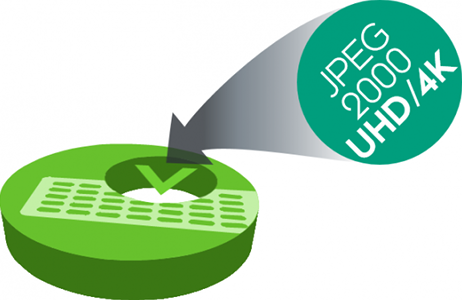 The JPEG 2000 UHD/4K Media Function requires the HBR Accelerator, which supports 3G-SDI input, and either encoding or decoding of one UHD channel. The Nevion Virtuoso’s visually lossless JPEG 2000 UHD/4K Media Function, combined with Nevion’s advanced protection mechanisms, enables broadcasters to utilize cost-efficient IP links for the real-time and high quality transport of professional media with low latency ad bandwidth utilization. It also enables service providers to build costeffective managed video services on IP-MPLS or Metro Ethernet circuits.